Mili Fay: Adventures In Publishing: Illustration Process: How Much Should I Pay/Charge For Illustration? 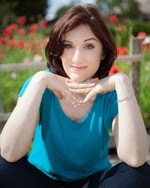 Follow Mili Fay's journey as she self-publishes her books, print and digital. Discover her resources, and never be afraid to ask questions. Illustration Process: How Much Should I Pay/Charge For Illustration? I was invited by Connie Dunn to write a column for her new online magazine. After much deliberation, I decided to call my column "Mili Fay's Hoots Of Wisdom". I will connect you all to the magazine as soon as it is live, but for now enjoy the article and let me know what you think. How Much Should I Pay/Charge For Illustration? Please allow me to introduce myself: I’m Mili Fay, the creator of Mili Fay Art, artist, illustrator, animator, writer, and sometimes singer. My vision is to use the gifts I was given to make the world a better place one artwork at a time. You can find out more about me by visiting www.artofmili.ca, by Googling my name, or by direct inquiry via social media. When Connie Dunn approached me about writing a column for Weeping Cherry International Review, I was thrilled to be offered the opportunity. There is always more I need to learn. However, working as a freelancer since I was fourteen, I managed to gather a few seeds of wisdom I’m happy to share. Therefore, in this column I will share with you completely biased, yet Honest Open Operative Tips (HOOTs) of Wisdom. Feel free to correct me, share your opinions, or to contact me with questions you would like to have answered in the future. In my debut column, I will try to answer a question I have seen repeatedly in LinkedIn Groups regarding illustration. Before I do so, let me share with you some relevant personal experience. If you are an illustrator, how many times were you asked to partner up with an unknown author for a chance to illustrate his/her book for free? How many times were you approached by non-profit organizations asking you to volunteer your services? 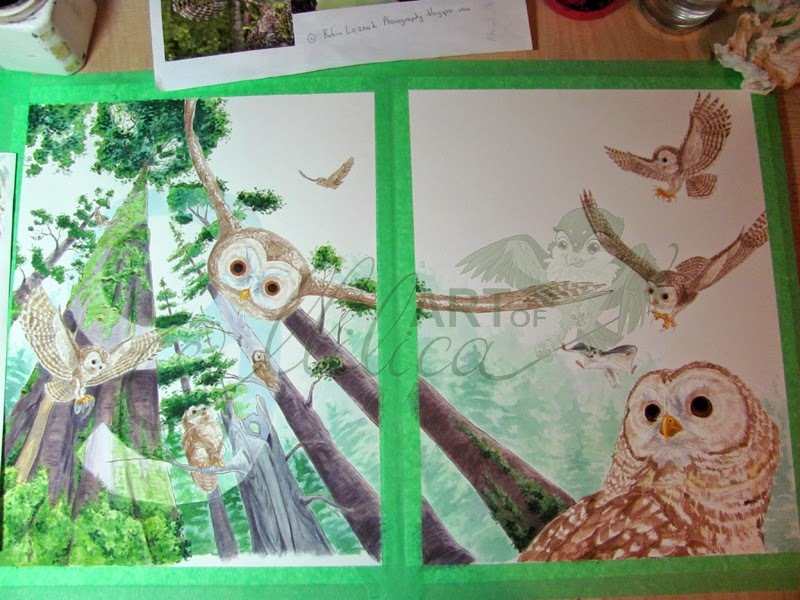 Once, I was asked to illustrate a “full-colour, Disney-style” picture book for $500! What other ridiculous offers have YOU received in the past? Upon receiving one of the above offers, I politely declined them while fuming inside at the other party for wasting my time. Then one day I stopped fuming, because I suddenly realised that most of the individuals who were making these offers where not evil opportunists; they were simply ignorant. What does an average person know about illustration? I’m sure that everyone who is not an artist, or who does not live with an artist, has an image of their grade school classmate producing a coloured drawing within an hour or two. They may remember sitting as children and drawing pictures during their spare time; an artistic friend giving them a drawing of their favourite super-hero; a kid in their class who created pages and pages of comics during recess. Drawing is fun! Drawing is easy. If a child can produce all those drawings in such a short amount of time, why couldn't an illustrator with years of professional training create even better pictures faster? Sadly, the illustration process is not the same as a child drawing and colouring a picture during play-time. So, what is this illustration process? In my experience the illustration process differs somewhat depending on whether the author and the illustrator are the same person, partners, or complete strangers. For the purpose of this column I will tackle the last; I will pretend that I have received a picture book manuscript and that I’m in charge of getting this book ready for publishing. As an illustrator, I will first read the complete manuscript. Then, I will read it again trying to visualise possible pages. Standard length for a picture book is 24 or 32 pages, because the signatures (sections of bound pages that make up the book) tend to come in lengths of 12 or 16 pages. Other than the length of the book, I also need to take into account the front and back matter of every professionally published book; i.e. copyright page, blank pages, title page, dedication page... Furthermore, I know that there are two pages at the beginning and end of the story that will be single page illustrations (usually of vertical layout, unless the entire book is of a landscape format), while the remainder of the book will be made up of two-page spreads (requiring horizontal layout). For this example, let us say that our fictitious picture book is 32 pages in length. Let us also assume that the front matter for the book is a Dedication Page, a Copyright Page, and a Title Page. The book has no back matter. This means that I am left with 28 pages (32 – 4 = 28). The first and last page are a vertical layout, and the remainder are two-page spreads. Therefore, I have to create 15 illustrations (2 + (26/2) = 15). I also have to design the cover. 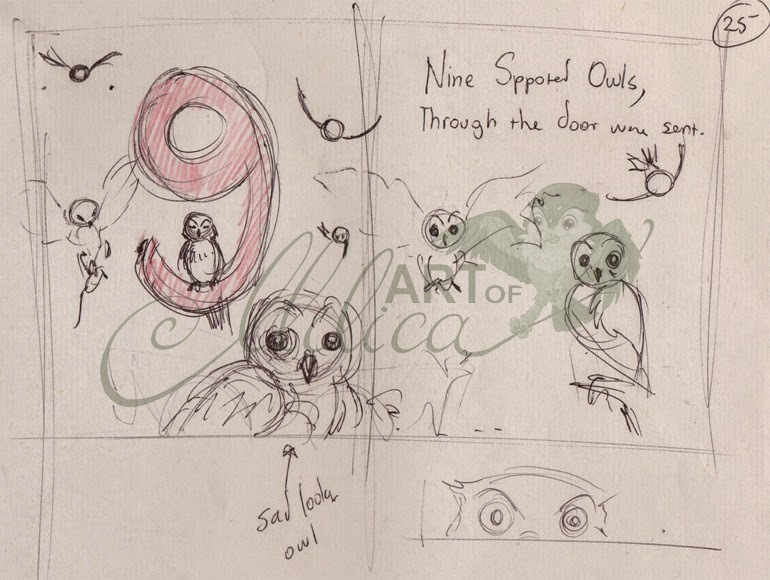 Thumbnail sketches are tiny notes we artists make for ourselves. They are not meant for another's eyes, and therefore they rarely make sense to anyone other than the artist. 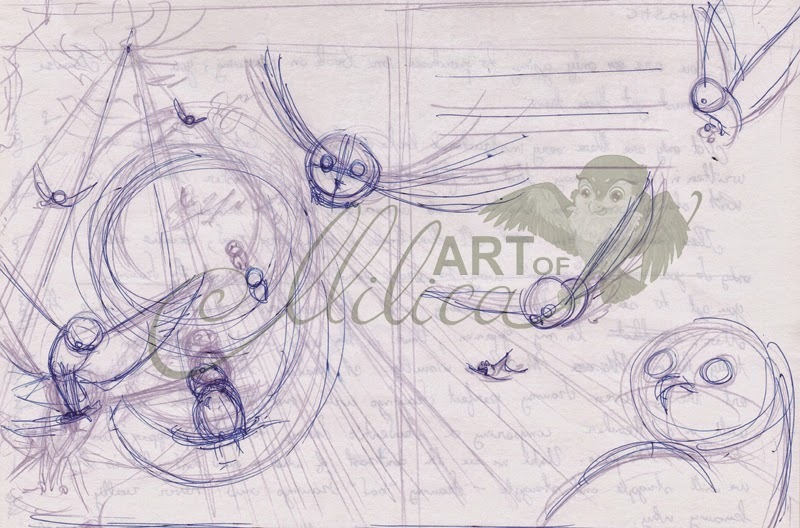 As I am reading the manuscript a third time, I will begin creating possible thumbnail sketches of each illustration. Sometimes I can see exactly what I want, and sometimes I need to create dozens of these sketches for a single illustration. 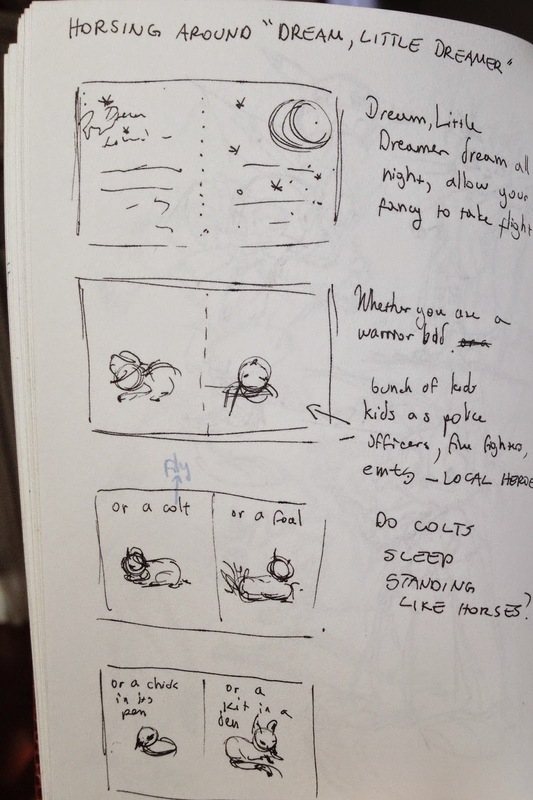 Thumbnail Sketches for "Dream, Little Dreamer"
After figuring out the number of illustrations and drawing the thumbnail sketches, I would probably contact the author. As an illustrator my job is to take the author’s vision, not mine, and make it better. After the conversation with the author, I will begin my research. Google is probably the greatest invention for us artists since cavemen figured out how to create paint. Before Google, artists had to go to libraries, they had to rifle through dozens upon dozens of stock photos, books, and maybe even film, before they could find the necessary visual references. Today, I type what I need into Google’s search engine and in seconds I have relevant visual information spread out before me. Let's say that the story I am illustrating is about a girl who visits her friend's homes and discovers each friend's unique culture. First of all I will need to “cast” my girl. I will look through several dozen pictures of girls on Google, sketching until I have a rough design of my heroine. What will my heroine wear? What culture is she from? Will she have jewellery? A ribbon in her hair? Will she wear a dress, pants, shorts, or a school uniform? Then my designing and research expands. How many friends will she visit? What do they look like? What are their homes like? If one of her friends is an athlete and she is visiting her friend’s room, what furniture, posters, toys, etc. will she find there? What do I need to draw to make the reader feel immersed in each character’s culture? Researching and designing continues until I have all the necessary characters, props, and background designs. The more characters and different settings a book has, the more time it will take for me to complete my research and design stage of the illustration process. In the fast-paced publishing industry Art Director/Editor matches the manuscript to an illustrator’s particular style. An illustrator rarely gets to speak with the author, he/she communicates through the Art Director/Editor. I prefer to communicate with the author, because the story is ultimately the author’s vision, and the illustrations are there to support this vision, not the other way around. Therefore, while researching and designing, I will always keep the author aware of what I’m working on, and eventually we will create a look that will make both of us happy, a look that would probably be better than if we have never met at all. Taking all of the materials collected so far, I will reread the story again and make more detailed sketches of each illustration. I will keep in mind the layout of each scene leaving a blank, or uncluttered, area for the text. Once this is figured out, I will make cleaner (sketches with a neater line and/or more detail) sketches of each. Then, I will send these sketches to the Art Director for approval. However, since in this case I am my own Art Director, I will stop the project for a few days and then look at what I have with fresh eyes, or I will send the sketches to the author and see if he/she has some suggestions. It is only after the layout sketches have been approved that I can begin to illustrate the book. 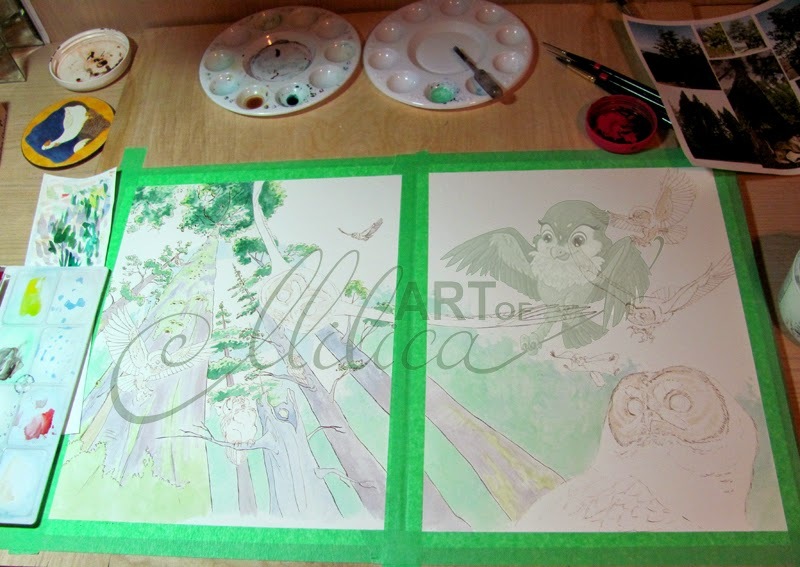 To illustrate this part of the process, I will use the artwork I have created while illustrating a two-page spread for my book, “Animals In My Hair”. Please note that I usually pick the scene I am absolutely sure of and work on that illustration first; I never illustrate in order. 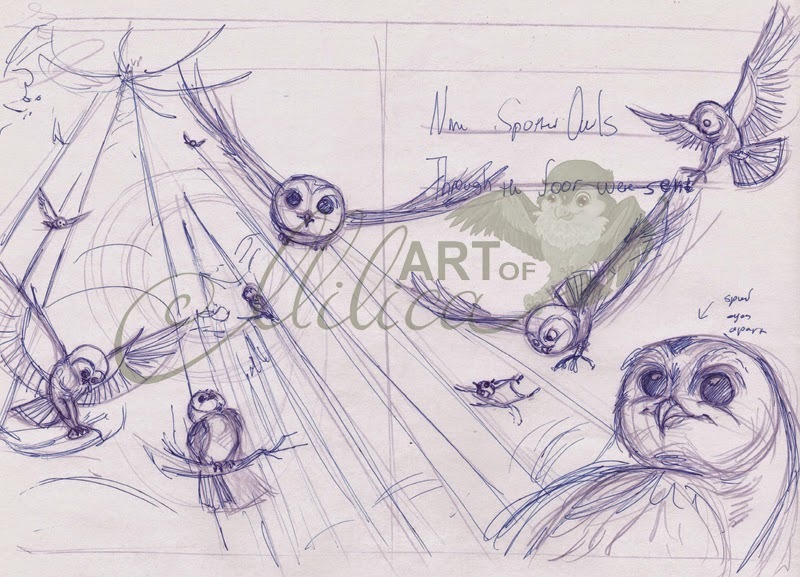 This is the original thumbnail sketch for the illustration. 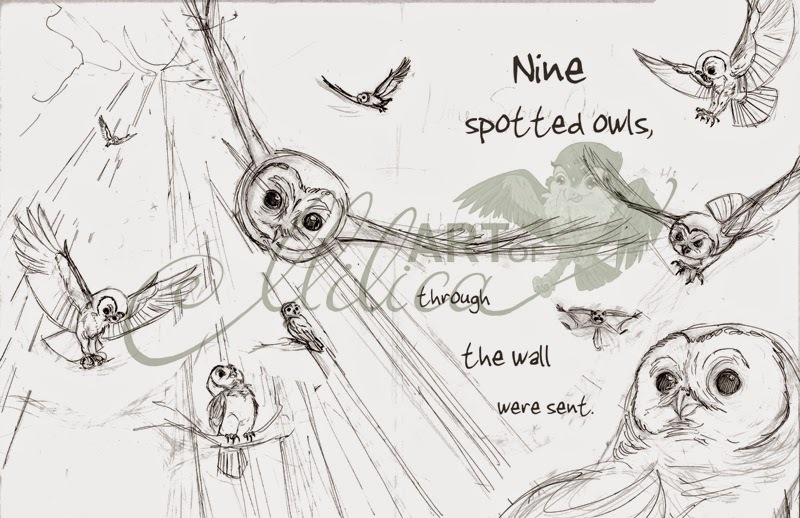 This is a thumbnail sketch I created when I have decided to make the numbers reflect the habitat. This is a rough sketch where I'm trying to figure out the composition. 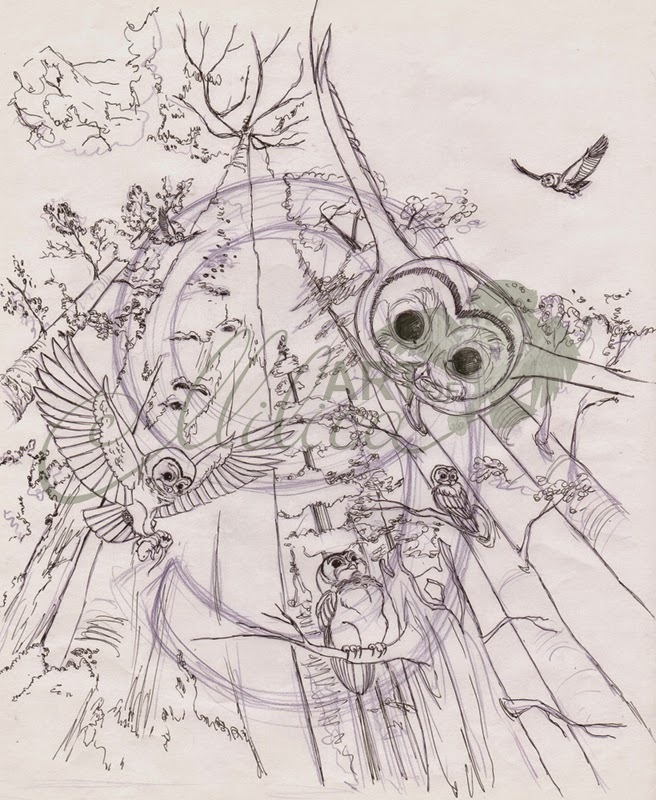 This is the final rough layout sketch. 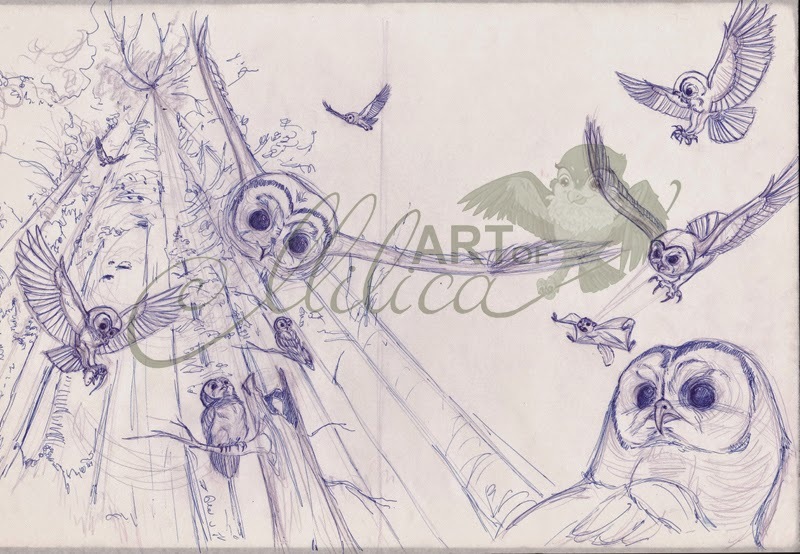 Once I had the final layout for the illustration of the owls, I began to draw. I redrew the image in a larger size, working out placements and adding some details. I scanned the drawing, and made sure that it fit the printing ratio (For example, if the printed image is to be 4” x 6”, I can choose to draw it at 8” x 12”, or any multiple of the 2:3 ratio. The more details that the drawing has, the larger my image has to be. If I was working digitally, I would keep the size slightly bigger than the print size and at least 600 ppi. I will never draw the image smaller than the print size, because to fit the print size I would digitally have to upscale the image, resulting in thicker, messier lines. It is better to draw your images bigger than the print size if you can, because scaling down will make your lines look neater and finer.). For “Animals In My Hair” the print size of a two-page spread is 18” x 12”. To this I added the extra ¼” bleed on the outside, making the actual image to be printed 18.5” x 12.5”. 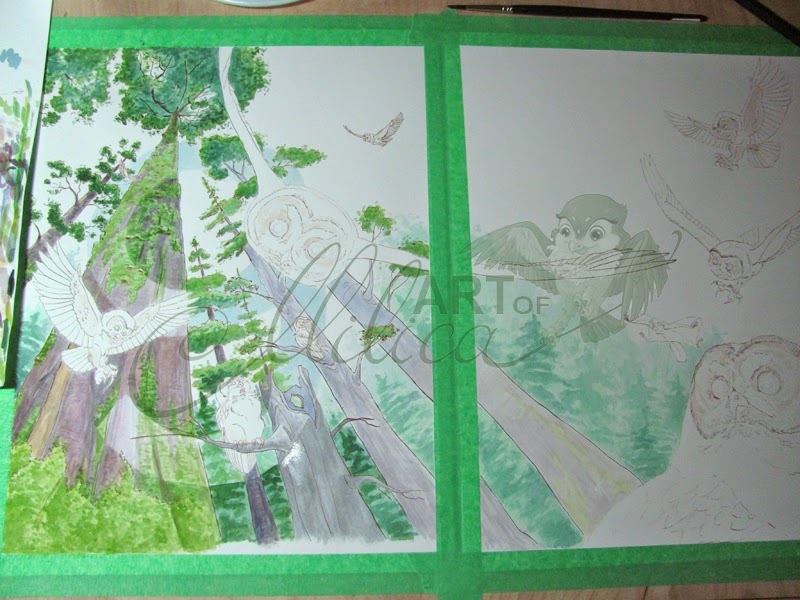 However, at this stage I sized the image to fit the 14” x 17” layout paper I used for drawing then printed the image. Part I and Part II has been completed. Part III and Part IV. In this case I have used the purple col-erase pencil and have cleaned-up with a blue pen. I scanned the pen-traced drawing and then sized it to fit my painting medium (in this case an 11” x 14” rag drawing paper), maintaining the printing ratio. 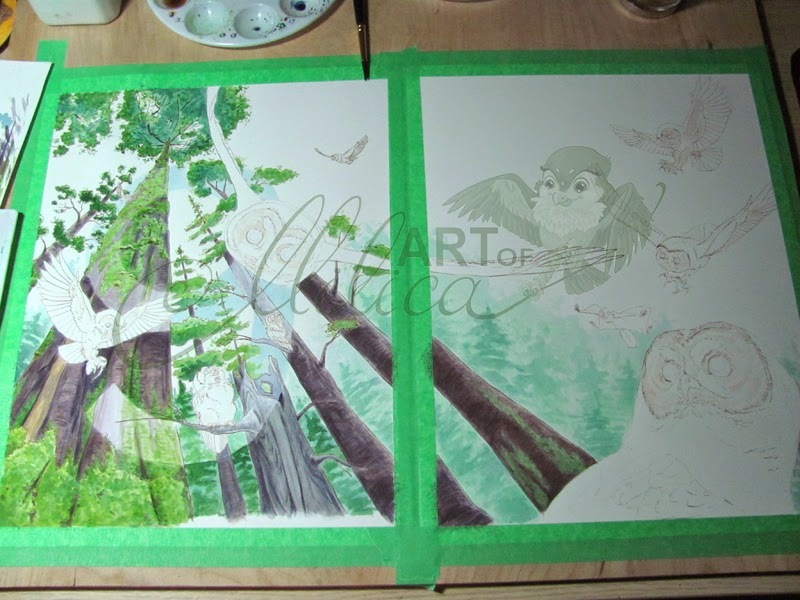 If I had a larger light table and scanner, I would create final paintings to fit the scanner's size. However in my case the 18.5” x 12.5” two-page spread had to be divided in two, so that in the end I ended up with two printouts of approximately 10” x 13.3” (the combined two-page spread now being 20” x 13.3”, slightly bigger than print size, which is how I like to work). On another layout paper, I carefully traced every line of the print, so that the divided illustration matched as closely as possible at the dividing edge. Then I cleaned-up the drawing again, before placing it under a blank rag drawing paper and tracing the final image with a crow-quill dip pen and acrylic ink. Part V and Part VI. Unfortunately, I forgot to take a photo of the clean ink line. 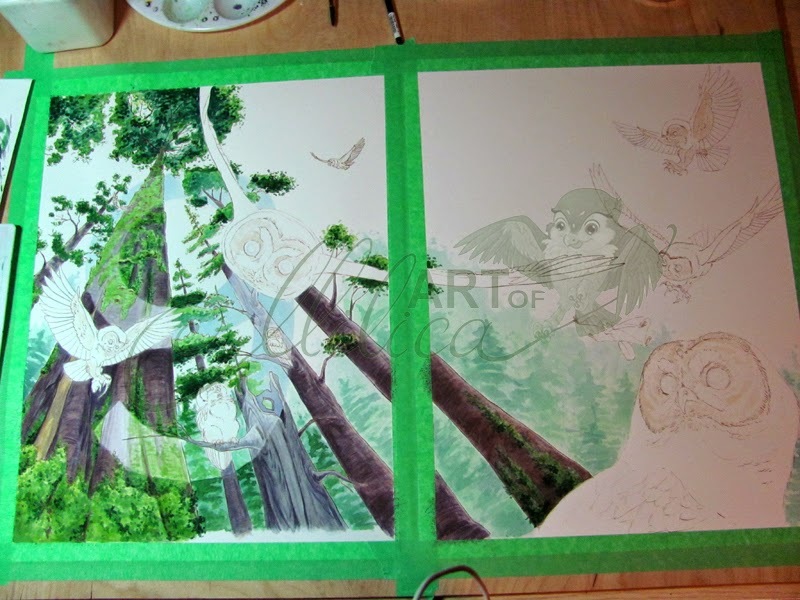 I took my final traced drawing, stuck it to the board with painter’s tape (dark green), and then began to paint. As you can see, I have used watercolour. 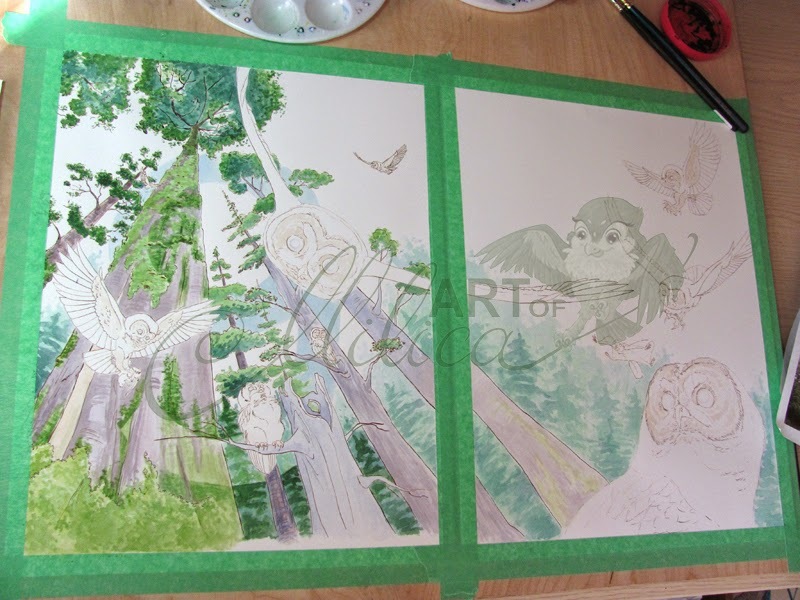 Painting a full-colour illustration such as the owls took about a week. I paint in thin layers, allowing the pigment to settle to the bottom of the tray and painting with the coloured water that is left on top. You can see some of the clean ink line in this image. Because the paint covered the original ink line, I had to go back and re-ink the entire illustration. At the very end I added highlights with opaque white paint. Once the painting was dry, I scanned it at 300 ppi (600 ppi is better, but my computer was too old to process that many MBs). For "Animals In My Hair" I had access to Photoshop CS5. I opened the two image scans in the program and attached them together. It did not matter how careful I was while tracing and painting, the two divided images of any illustration never lined up perfectly. I therefore used the Clone-Stamp Tool to fix the illustration. Once the image was perfect, I used the Type Tool to add text. I sized the image, making sure to leave room for the outside bleed and the inner seam, so after the text was added the image was ready to be printed. I saved the image in RGB Mode for digital purposes (sans outside bleed), and also in CMYK Mode which I then sent to my printer in PDF format. Step 6: Repeat Step 5 until every illustration is done, including the Cover. I have never had a job where the work went according to plan. I had clients making changes resulting in delays. I had equipment dying and having to rework from a certain saved point. I had a glob of ink fall onto my illustration after I have spent hours painting it. I got sick. I had family emergencies... Life happens causing delays and deadlines to be pushed back. As you can see, illustrating a book is far different than being a child drawing pictures in your spare time. It is a real job that requires more than artistic skills. So, what do you think an illustrator should be paid to illustrate a picture book? How can an employer figure out a fair wage before they approach an illustrator for a job? There are two main factors that determine the price of an illustration job (or any creative job): Time and Quality. An employer can pick any of the two sets. Picking all three sets is usually impossible, because anyone who produces quality work quickly will not be cheap. If someone agrees, an employer can be sure that their work will be of only acceptable, not competitive quality, or that this person is too naïve to know any better. In the last case, the employer managed to take unscrupulous advantage of the employee. Congratulations! There is another factor that determines the price, and that is fame. The more famous an artist is, the more expensive his/her time will be. To get the best price for the best work, a truly visionary employer will find these talented artists before they have managed to make a name for themselves and use them until they become famous, or have been drained of all creativity. For those employers who do not support slavery, here is a way they can calculate a fair wage for an illustrator. Illustrators when you are accepting a wage, please be aware of these factors. According to livingin-canada.com the average wage for someone working as an illustrator in Toronto, Ontario is CND$26.25. An employee of greater skill will cost more, and employee of lesser skill may accept less. As an employer, will you offer your employee benefits? Freelancers have to pay for their own benefits, so if you are planning to offer the position to a freelancer, make sure you add the adequate amount to the hourly wage. Will your employee be working at a set work schedule, or will he/she have to work overtime? Add on the cost. Is your deadline flexible? Can the employee work on your project in his/her spare time? You may be able to negotiate for less money. Once you have an hourly rate you feel is acceptable, you can calculate the set fee for a particular project. Consider the illustration process I have shared with you, determine how many hours it will take to complete the said project, and multiply. However, always have an extra third of the calculated fee available in case of delays and unexpected changes. This will give you the budget with which you can approach your prospective illustrator. 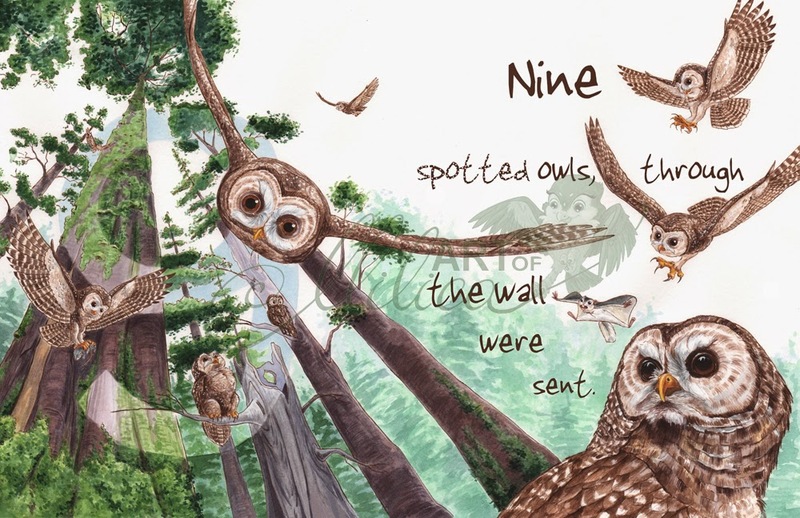 Using our 32 page picture book as an example, let’s say that each illustration takes a week to illustrate. We have 15 illustrations plus the cover; 16 illustrations in total. Therefore, the project will take 16 weeks to illustrate. In my animation studies I have read that the time it takes for designers to design the movie, equals the production of the movie. Following this logic we will add on 16 more weeks, making the total time of the project equal 32 weeks. An average work week is about 40 hours. Therefore, the project will be 1280 hours long. Let’s say our fair wage is $30/h. This particular book will therefore cost $38 400. Add on a third for unforeseen expenses, and you should have an available budget of $51 200 for this one book. As an employer, what can you do to make your illustrator’s job easier, which will result in you saving more money? Research. There is no need for the illustrator to do all the research. Search Google Images yourself until you have a complete vision for your illustrations. Early in my illustration career I have illustrated for a non-profit French language school. The employer did not have much of a budget, but we negotiated free lessons, and he had pages and pages of printouts of what he envisioned for each illustration. As a result I knew exactly what he wanted, and was able to produce each illustration faster. Trust. Trust your illustrator. You have hired him/her to illustrate for you because you admire his/her skills. Therefore, do not try to micro-manage every illustration. Do not allow an illustration to progress beyond the sketching stage and then ask for revisions. Details? How detailed do the illustrations have to be? Do they need to be in colour? Do you need a scene involving many characters? Do you need the background? The more an illustrator has to draw, the more time it will take him/her to do so. In animation, we were taught early on about line mileage; the more lines your character has, the more time it will take for an animator to animate the character, resulting in greater expense. Also the more colours a character has, the longer it takes for the painter to colour the character. The same principles apply to illustration. Consider the job. Do you really need those “Disney-style, full-colour” illustrations, or can your story be told with simple appealing designs such as Ruth Ohi creates? Be honest. Do not try to trick your illustrator. If you have a low budget, ask your illustrator what he/she can do with the illustrations to make the work fit the budget. There you have it; my first HOOTs of Wisdom. I hope that you have enjoyed reading this column. If you have any questions, suggestions, or complements, please do not hesitate to contact me. 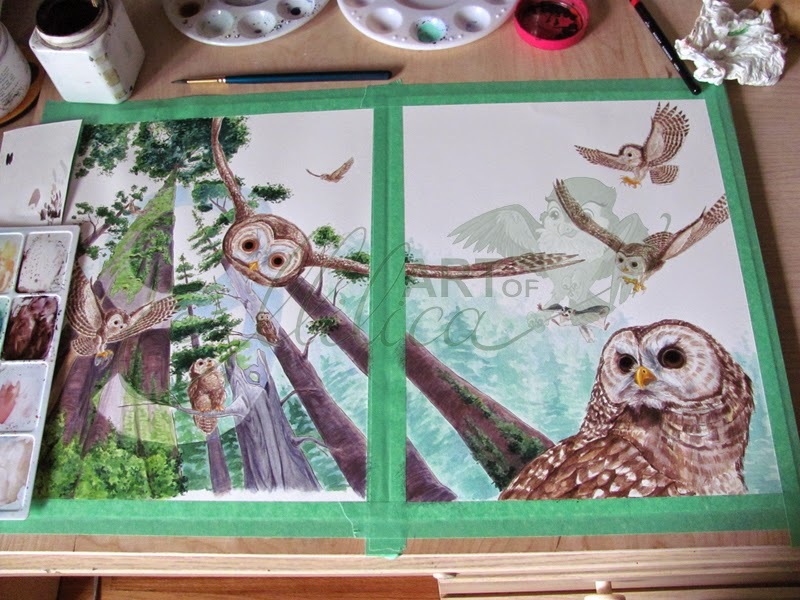 Mili Fay, a Toronto-based artist, classical animator, illustrator, writer, and singer, is an award winning graduate of Sheridan College and Art Instruction Schools. 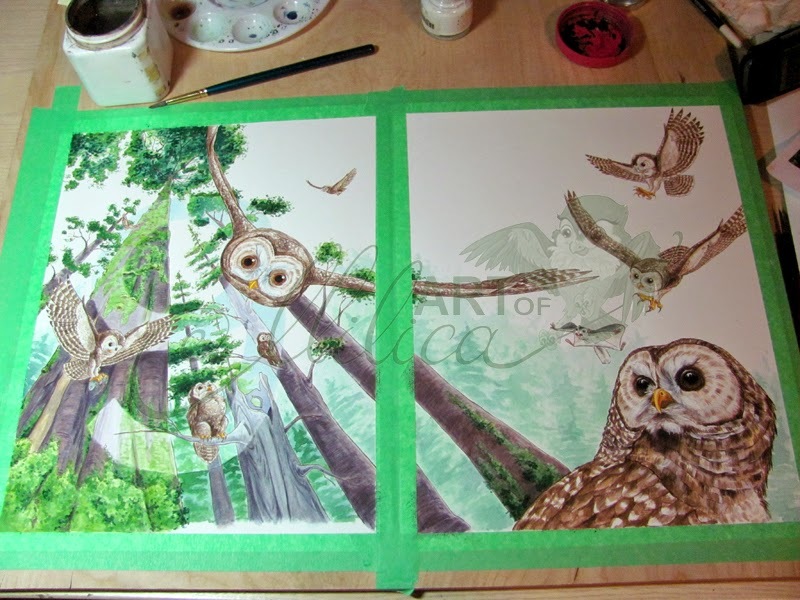 In November of 2011 she created Mili Fay Art determined to support the world one artwork at a time. Her latest published work is Animals In My Hair; a story about a boy who goes for his first haircut only to find endangered animals falling out of his hair. Presented at INSPIRE! 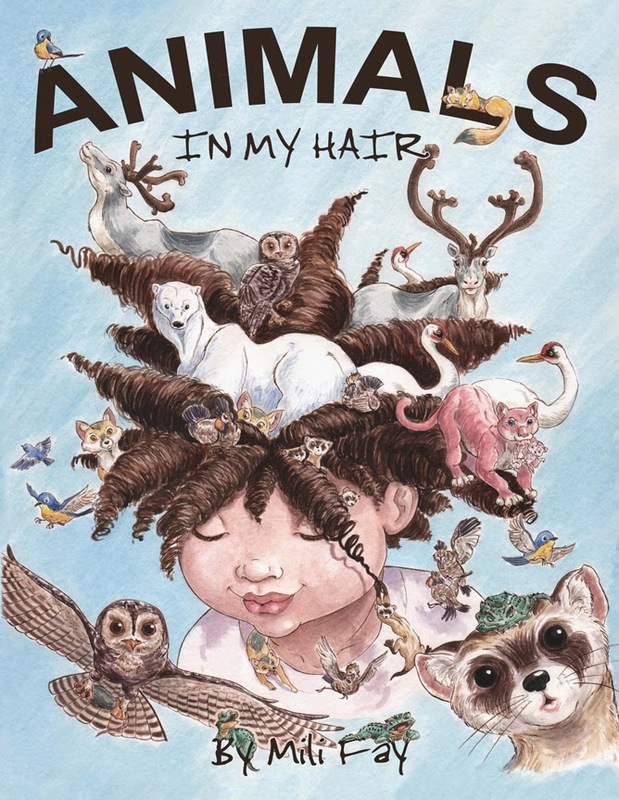 Toronto International Book Fair (November 14, 2014) out of 700+ submissions, Animals In My Hair, is the world’s first ever Artwork Book; a new type of picture book that seamlessly combines the best features of fine art, picture books, activity books, and educational books. In accordance with Mili Fay Art’s vision, 30% of all profits from Animals In My Hair book and merchandise will be donated to wildlife conservation. Join Mili Fay Art Fan Club to stay in touch with Mili Fay and to be the first to find out of her upcoming books and artworks. Wow, Mili your work is beautiful. 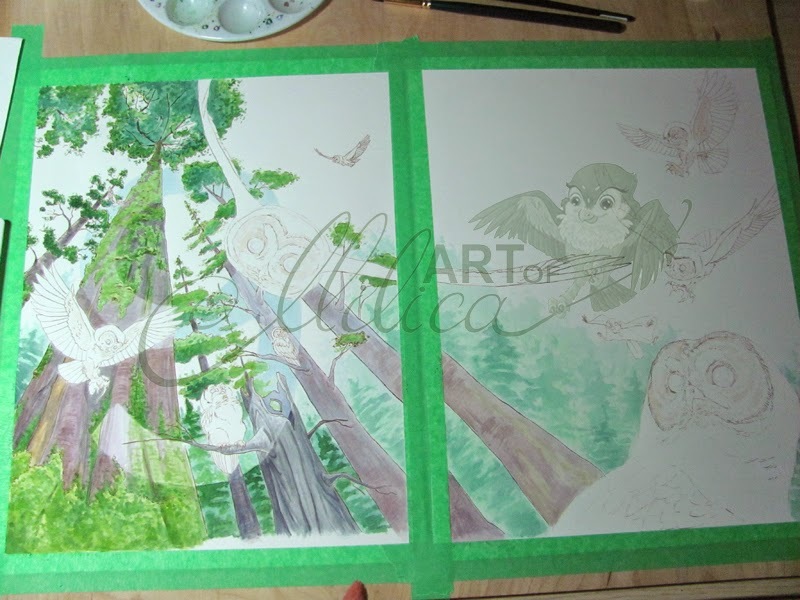 I am an artist trying to create my own picture book and this post was very helpful to me. Thank you for sharing your work I will book mark this page as a reminder to keep going. Many people ask when is my picture book ready and I feel bad for saying it takes time to do the illustrations and now, looking at the way you work it makes sense and good quality art takes time. I will not rush it and thank you for your insights. Thank you for the complement. You are very welcome. Please be courteous. Abuse of any kind will not be tolerated. Goodreads: "Animals In My Hair"
Share book reviews and ratings with Mili, and even join a book club on Goodreads. "ANIMALS IN MY HAIR" KINDLE BOOK LAUNCH PARTY! What Writers Need To Know About Illustration? Part 07: Mili Fay Wonders--GMail or EMail Service?